A magical book for which Penguin will send one winner a copy when I post my review. Lovely things, all of them. The kitty is beyond cute. I can't believe she does that every time. It's nice to sit back and reflect on the good things in life. Have you ever tried peanut butter M & M's? 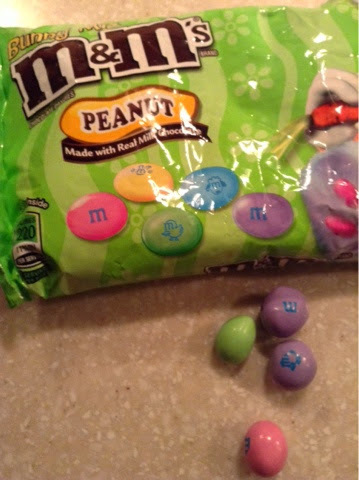 Peanut M&Ms… As if I didn't already know how much I like you!! Caroline, of beauty and sleeping cats, I wish you could see her in real life. This picture does not do her justice. She is the most charming thing, almost like a dog in her loyal affection. I haven't tried peanut butter m&m's, but I imagine I'd like them! I like the mint ones very much, but not the white-gooey candy corn ones that came out at Halloween. Can hardly imagine not liking an m&m! Well, of course none can compare to the Wedding Week of yours! Yay! I love posts like these. Love the pen and shamrocks too. Happy week to you too sugar! Love the photo of your precious kitty. How cute! I'm fond of the Iron Cross (aka good luck plant) and haven't had one in ages. Bellezza, I loved this post! It put a smile on my face. Thanks for sharing! Your kitty looks so much like mine – although mine hates water, but is equally affectionate and loyal. Lovely things, which made my week start off well. I agree, stick to tried and tested sweets even at Easter! What a wonderful post! 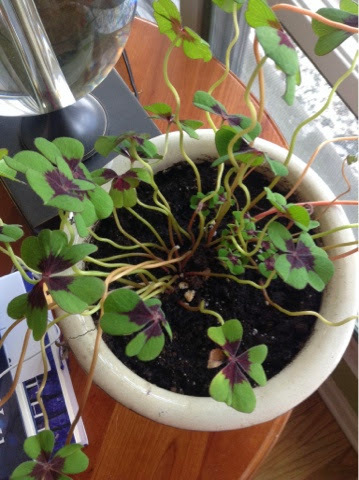 And, aren't those shamrocks beautiful. Can't wait to read your thoughts on the House at the End of Hope Street! I have that book waiting for me. Yay. We are lucky to have an affectionate and loyal cat. There's a second one who resides in our home, but she's more in love with our Husky than she is with us. Except for when we offer her Temptations, the only food for which the advertisement is spot on. Oh, I'm loving the House at the End of Hope Street! It was just the thing I needed to bring me into a magical, spring-like state of mind. Of course, I haven't finished it yet, but I am loving it so far. We'll have to talk. I loved that book passionately! Love the kitty! This is SUCH a nice post! Your cat is lovely. Mine kept creeping up and standing by my head last night until I shut him out of the bedroom. I think he's trying to kill me. He is not affectionate and loyal. Lovely lovely post! Taking a few moments to appreciate and savor the beauty nearby is refreshing. I wish the picture actually caught how darling this kitty (of my son's) is. We've all adopted her as our own, my husband and I, because she's so very endearing. But, I know what it is when a cat is not exactly affectionate and loyal. That almost hurts my feelings! It helps so much to point out, even to oneself, all the sweetness that is around. Miss Dixie Rose sends her regards to Samantha. She's a beautiful cat, your Samantha, and that's such an endearing habit she has. I'm glad to have your endorsement of mint M&Ms, too. I've looked at them, and haven't quite drawn up the courage to try them. Now I shall! Take the fact that I like mint m&m's with a hint of caution; I also like Thin Mints from the Girl Scouts, Frango Mints from the now gone Marshall Fields, and McDonald's Shamrock shake made half and half with chocolate. I love your wall colour! We are so alike in aesthetic tastes! The living room in my previous home was the same colour. 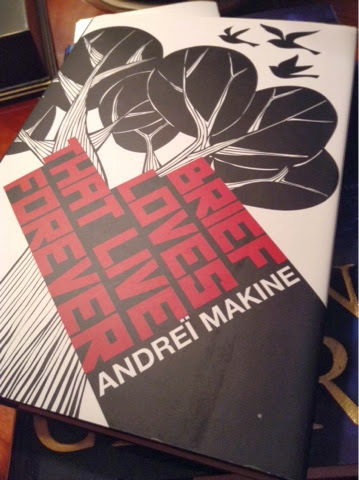 I am so behind in new titles but that Brief Loves That Live Forever seem right up my alley, can't wait to hear your thoughts about it..
Merci DB, it's so nice to touch base with the simple things of joy like what you have shared. There's so much in the simple things in life that we can be grateful for. I have no cat waiting for me to wash my face, but my puppy knows when I need a cuddle and when I need her to listen to me. That's love. Everything about this post is simply wonderful — so much to love! 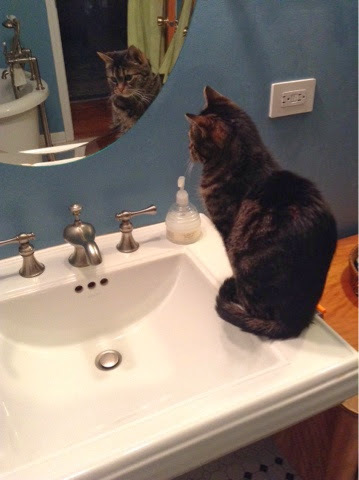 But I especially love your sweet kitty in the mirror. Aren't they just the best? And the Easter M&M's! I need some of those! Your new book offering has a great cover. I'll be curious to hear how you like it! I have a passion for fountain pens, Arti, but sadly the paper of today allows too much bleed-through. Still, they work effectively on a Moleskine notebook (even though most writing seems to be done electronically now). Reading for the IFFP has been such a wonderful adventure, and The House At The End of Hope Street a respite from much dark despair encountered in the Foreign Fiction Prize long list. I did love this wall color, stolen from Pottery Barn once upon a time, but now I'm ready for a rich cream and white. Did you tire of your eventually, or move away too soon? I can't wait to open Brief Loves That Live Forever, too. I love love stories, and how intriguing to have this one translated from French but written by a Russian. It's been important to me, with a bit of an emotional shadow encroaching on my soul, to pick out all the lovely things. I hope to do such a post every Sunday evening,relishing the week that was while anticipating the one that is to come. Perhaps you and others will join me? It's a good thing for puppies who love us unconditionally. With great affection. I never was a kitty person, but my son changed all that when he brought Samantha into our home. Now he can't take her out again! I think The House at The End of a hope Street will appeal to you and so many others whom I sense have a gentle and wise spirit. Pretty kitty and even prettier bathroom. Love that blue paint (and the tub/sink fixtures!). We've chatted about your pen. 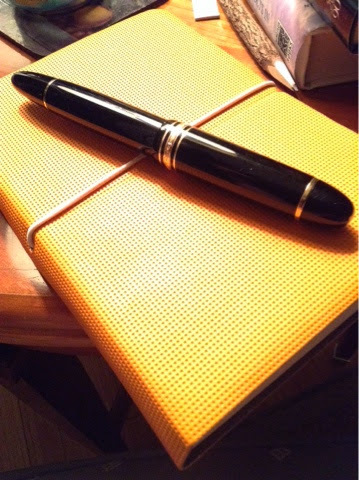 I have a fountain pen, but rarely seem to use it. Not sure why. Yes! Peanut M&Ms! And, how about Hershey Bars with Almonds? Not as good as Godiva, but still yummy, especially after pizza or Mexican food. 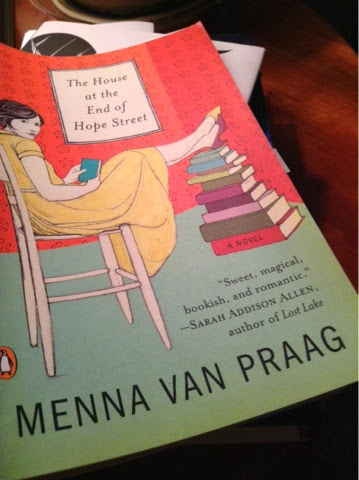 Love the cover to The House at the End of Hope Street. Looking forward to reading your review. It's almost the weekend! Hope you didn't blow away with the 40-50 mph winds we had here last night.